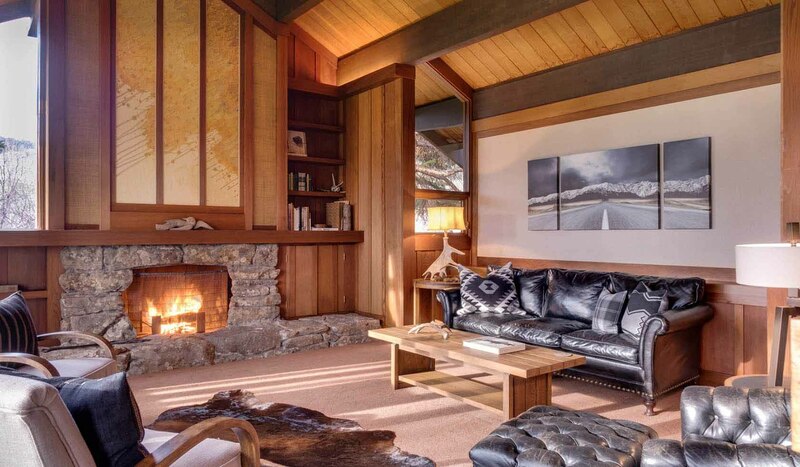 Beautiful four bedroom home designed by renowned architect Jim Morton (designer of resorts in both California & Hawaii) near Bozeman and Bridger Bowl Ski Area. On a beautiful 2000 acre working cattle ranch. The 5000 square foot home has been newly renovated in the winter of 2014/15. Redwood paneling and gorgeous design features throughout the home. With a pond in the yard and Jackson Creek running through the property, it's a wildlife oasis. Brief Description: Green Mountain Ranch is a special place for the Bozeman area. Not only is it a gorgeous 2000 acres of private mountain foothills just outside of town, but it's also the former home of renowned architect Jim Morton, a nationally recognized designer of high end homes and resorts. Built in1978, it's just undergone a $200,000 renovation and Mountain Home is delighted to be able to share it with our guests. Green Mountain Ranch is a working cattle ranch with beautiful mountain pastureland, some of it under conservation easement. Come to the ranch to enjoy privacy, access to hiking and cross country skiing out the back door, and to the amenities of Bozeman, just a ten minute drive away. Bedrooms and baths: There are three master suites each with king beds, and a fourth with a queen and two sets of bunks. The first master, on the main floor, has a vaulted ceiling, a wall of windows looking out to the yard, and an attached bath with slate floor and shower, separate tub and stall shower. The second master, also on the main floor, has an en suite fireplace, and a bath with stall shower. The third master occupies the whole upstairs and has magnificent, almost 360 degree views of the ranch, Green Mountain and the Bridger Mountains. Its en suite bath has slate floor and separate shower and tub. The fourth bedroom is on the lower level and is a combo family room/bedroom with a queen bed, two sets of twin bunks, pool table, bar and refrigerator. It has a bath with stall shower. All bedrooms have TVs. Kitchen: Like other areas of the home, the kitchen is newly renovated with new appliances. The side by side refrigerator has in-door water & ice, there are double ovens, an electric range, and a microwave oven. The kitchen opens up to the sunny south facing breakfast area, with table for six, sitting area, TV, and doors out to the patio and deck, with a gas barbecue grill. Dining area: The dining room table will seat eight comfortably, and there's a wall of windows looking out to the pond and mountains so that you won't miss any wildlife activity at meal time. Living room: A few steps down from the dining room is the living area, with a high vaulted ceiling and with another bank of windows to let in the view of the pond and the Bridger Mountains. The rich paneling, the rock fireplace (made of stones collected on the ranch), and the built in speaker system make this a cozy area to gather after your daily adventures. Built in bookshelves have a great selection for readers, with everything from classics and local history to current favorites. Setting, acreage, and views: Green Mountain Ranch is a 2000 acre mountain foothill property just a ten minute drive from Bozeman, but with the feeling that it's a world way. With grassy mountain slopes, spruce and Douglas fir forest, Jackson Creek and a pond, it's a lovely retreat and a great wildlife sanctuary. The ranch is also the last working cattle ranch in the Jackson Creek area! Outdoor Amenities: Your yard is amazing. In addition to the patio, gas barbecue, and the deck with views of the pond and mountains, there is a screened porch just off the breakfast nook. And one of our favorite things about a visit to the ranch are the magical areas down by the creek. There are mown paths through the woods that open up to a little parkland with seating and a fire ring by the creek.